The Boylan Wye: Why The Wye? 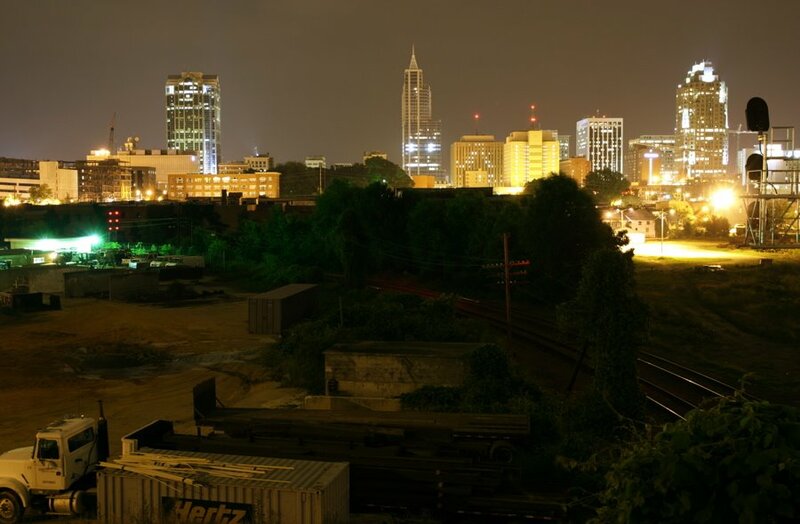 Next time you are up on the Boylan Ave. Bridge, or on the deck of the Boylan Bridge Brewpub, taking in the view of Raleigh’s ever-growing skyline, cast your eyes downward and you will see the skeletal remains of part of Raleigh’s industrial past. Just where the CSX and Southern RR tracks emerge from under the bridge is the Boylan Wye. At this point the tracks diverge, forming a Y shape, or “wye.” It’s hard to imagine now, but this area was once a hub of some of Raleigh’s railroad-related industries. Booming from about 1900 into the 1950s, the wye was the locale of several coal yards, ice plants and iron works. At one time a mattress factory was here, and later a concrete plant. These businesses all used the the wye as a switching yard and as a means to move freight in and out. 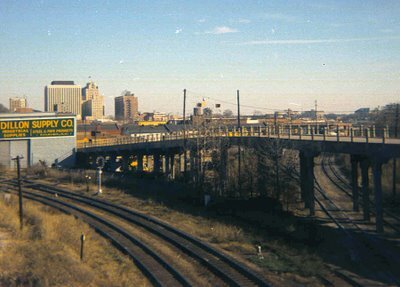 Passenger trains also used the wye to back in and out of the Union Station, then located two blocks away on Nash Square. Nowadays all the hubbub is gone. You can still find remnants of the coal yards and the concrete plant, and there’s even the concrete foundation of a turntable down there. As the images of Raleigh’s railroad history pass from thought, your eyes cast upward now, taking you back into the 21st century. The railroads refer to it as the Southern Junction, so thats what I call it too. Its a great spot to go at night downtown and chill, because nobody else is ever down there. 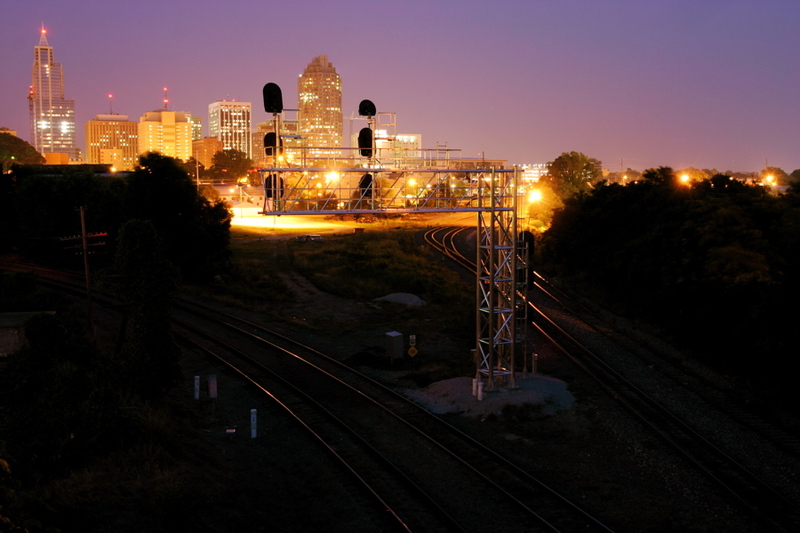 And obviously its the best place in Raleigh to watch trains. “Southern Jct” is actually around the bend between Hillsboro and Jones Sts. It was put in around 1974 to allow Southern Rwy trains to get to Glenwood Yard after the Southern purchased the original (grey) Norfolk Southern. Zman — Have you ever heard of a “Pamlico Junction”? It’s clearly marked on a 1914 geologic survey map of Raleigh. 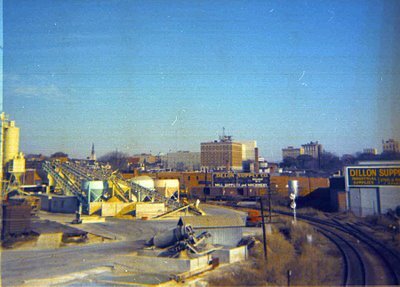 It’s location was where the Norfolk Southern and Seaboard tracks cross, north of downtown, more or less where the Atlantic Ave bridge carries traffic over the tracks today. I’ve not seen the designation on any other map of Raleigh. Yes indeed. Pamlico Jct is an old name for what is now called Edgeton. There was a small two story interlocking tower which controlled the junction, built and manned by the NS. No idea when the name changed or when the tower came down – I started exploring that area in the early 1980s and there was no trace of a tower at that time. One of my uncles named “Casey Jones” was an engineer many years for the Norfolk Southern RR. He lived there in Raleigh. Thanks for this story on the Boylan Wye. A few years ago I purchased a small number of cobblestones from a paving company that had the job of repaving the wye some years before it was torn down. Instead of paving over the cobblestones, they removed them and they had been sitting at their warehouse off 401 for over 30 years. This area is in the news again with the approval of the new Union Station. It is a real shame, a sad travesty to know that once thriving cities are just modern day slums. Such is the case all over this country, once leaders in innovation, industry and manufacturing but now our country is a laughable joke. Think long and hard obout your economic history then forecast a thought or two on free trade then look around at the cityscape where thriving companies once were.